In this post, I would like to share the best activities I know to teach questions in the present simple tense. The aim of these fun activities is to help your students form the YES/NO questions and short answers correctly. I have used all these activities in my classes and they worked very well. In this post, you will find a game called Battleships to introduce the grammar. Then there is an infographic explaining the question formation, a fluency activity to make the question formation automatic, and several speaking activities to practise the questions in real life situations. In addition, there is a video plus an infographic explaining the formation of short answers. These are then practised in speaking and writing. I hope you will find these activities useful and fun. It is important to involve the students from the very beginning. That is why I start the lesson with a game. Display the first slide on the board and explain that you have hidden a treasure there. Promise a sweet for the student who will find it. Let the students give you the coordinates and then click the appropriate button. Do not explain how to give the coordinates. Just refuse the bad coordinates and students always quickly understand the way the coordinates are given. When the students find the treasure reward the winner. Tell the students that they will play another game and display the second slide. Play again. By now, all the students should be able to understand the rules and give the coordinates. Print the following worksheet and give each student 2 tables. Tell them, that now they are going to play the same game in pairs. They must not show their tables to their partners. Students hide 4 treasures in the first table. They give coordinates and they try to find their partner´s treasures before he/she finds theirs. When they finish, they can play another game in the second table. When you feel that the students have played long enough, display the third slide. Students work in pairs, and ask and answer the displayed questions in pairs. The aim of these activities is to expose the students to the grammar before you teach it. When they use the grammar before we explain it, there is a better chance that they will understand it. After exposing the students to the grammar, it is time to explain it. Display the following infographic /slide 4/. Questions in the present simple tense are formed in the following way: At the beginning there must be DO or DOES. This auxiliary verb is followed by a subject and the verb in the basic form. If your students form affirmative sentences correctly, tell them that the auxiliaries are followed by a normal affirmative sentence only the -s ending has vanished. Once you explain the grammar, give your students 5 minutes to write as many questions as they can (slide 5). They can use only the words in the infographic. Go around the classroom and check their questions. In the end elicit several examples. It is time to explain the formation of short answers now. As it is not very polite to give just YES or NO answer in English, native speakers use the short answers. Display the infographic (slide 6) and demonstrate how the infographic works. For example: “Do you like Maths?”. Elicit, which word is at the beginning. Then point to the word in the infographic. Elicit which word follows DO. 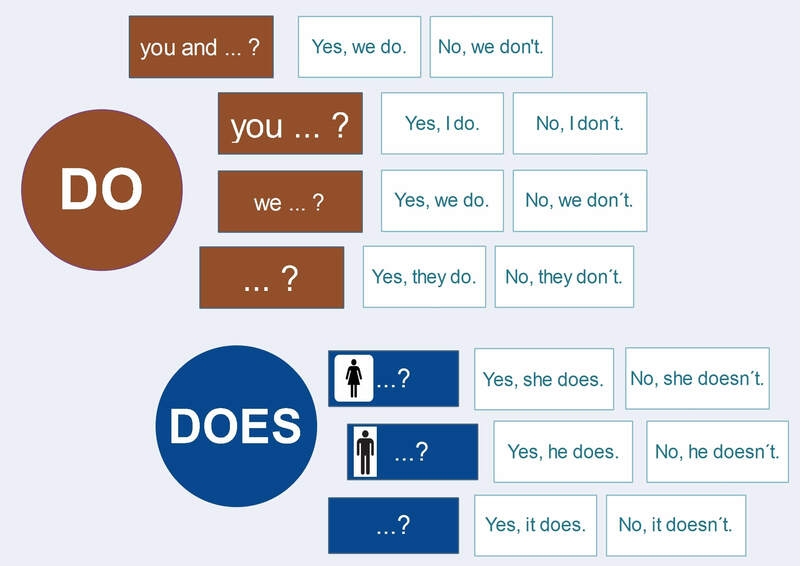 Point to the infographic and show that after “you” there is no “and” and thus the possible answers are only “Yes, I do.” Or “No, I don´t”. Play the video which demonstrates the formation of short answers. Stop the video after the fourth question and let of your students give the correct answers before you play the explanation. The voiceover was done by Kevin Medansky who offers the best and cheapest voiceover service at Fiverr.com. Once, you feel sure the students understand how the infographic should be used, move to another task. Students take the questions they wrote previously and now they have 5 minutes to write short answers (slide 7) for all of them. After this, display the questions for speaking again /slide 8/ and students work in pairs and ask and answer the questions again. However, this time they have to use the short answers. It is a good idea to change the pairs so the students do not work with the same partner. We started the lesson with a game, so it would be nice to finish with one, too. Print the worksheet below and give one to each pair of students. One of the students chooses one series of pictures, for example no. 7. He/she does not tell their partner which he/she has chosen and the other students has to guess it by forming YES/NO questions about the pictures. Once they manage to guess the picture, they swap their roles.